If we think about Rihanna’s achievements throughout the years, one cannot help but feel proud. She started out as a young hopeful living in Barbados trying to get her big break to now being known worldwide for her many achievements and she’s only 27! Just to mention a few of her accomplishments; Rihanna was named the “Best-Selling Digital Artist of all time”. She has won many awards including 2 Brit Awards, 8 Grammy Awards, 23 Billboard Music Awards and 8 American Music Awards. Many of her songs were number one on numerous charts and have also been ranked amongst the best of the best. She released seven albums with an eighth album on its way. We also saw her in movies like Bring it On: All or nothing in 2006 and Battleship in 2012 (this would also explain why Rihanna refers to her fans as Navy). With winning the first-ever America Music Award Icon award in 2013, Rihanna has shown the world that it is never impossible to achieve the impossible. Just when you thought Rihanna could not achieve anything greater than all her past achievements, she shows the world yet again that she’s an unstoppable force to be reckoned with. In March this year (2015), it was announced that Rihanna is the new face of Dior. 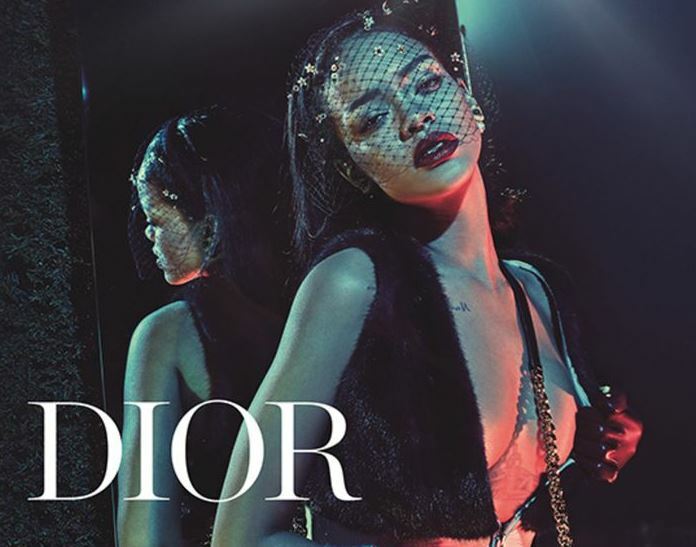 This announcement wasn’t just any achievement in Rihanna’s books but also a first for Dior. Rihanna is the first black spokesperson for this brand. Known for being the founder of Christian Dior, one of the top worldwide fashion houses, Christian Dior was a designer who grew up in Northern France. Christian was born in the town of Granville but moved to Paris, France when he was five years old. He had four siblings and he was the second eldest of five children. His parents had high hopes of him becoming a diplomat but Christian had other plans in mind. He was very artistic and had developed an interest in art. Although some might not have known, Christian was gay, but he wasn’t very open about it. He decided to leave school and his Father helped him start his own little art gallery where he went into a partnership with his friend. Due to a family tragedy the gallery had to be closed 3 years later. Christian went on to do many things before starting the Christian Dior Brand like; he worked for a well-known fashion designer, he also joined the army soon after and he joined Lucien Lelong’s fashion house. He then went on to start his own fashion house; one of the world’s top fashion houses. The French fashion house was founded on 16 December 1946, but celebrates 1947 as its established year. The first Dior Perfume, Miss Dior, was launched in 1947. This perfume was actually named after Christian’s sister. In 1956, this was Dior’s 10th anniversary. Christian also made it to the cover of Time magazine in the year 1957. A few top highlights where actresses are concerned, had large numbers of dresses made by Christian himself. Females that has been the face of Dior and involved in the Dior brand includes Charlize Theron (face of J’adore fragrance), Natalie Portman (starred in the “La Vie en Rose” fragrance film), Jennifer Lawrence (handbag line) and Marion Cotillard (face of Dior since 2009). But moving on to the present, Rihanna is the new face of Dior and she is simply over the moon. Rihanna says this is a “Big deal”. She also told MTV News “It feels fantastic. It is such a big deal for me, for my culture, for a lot of young girls of any colour. I think to be acknowledged by Dior means a lot, as a woman, to feel beautiful – to feel elegant and timeless”. This announcement has made history considering the fact that she is the first and only black woman to be the face of the brand. Rihanna has begun filming the fourth video episode for the “Secret Garden” which is said to be released in spring time. In this video, Rihanna can be seen walking around in stylish Dior dresses around the Palace of Versailles. The photographer involved in this video/shoot is Steven Klein. Being a part of a brand as big as Dior, can only spark better and brighter opportunities in the future for Rihanna. She has great achievements to her name and things are just getting better for this Barbadian beauty. This could be seen as a historical moment in the fashion industry years from now and open new doors to the world of diversity.